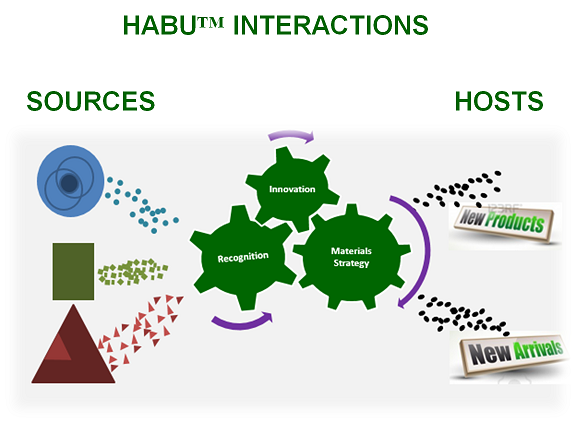 HABU(R) is a way of thinking around maximizing use of material resources. The necessary linkages are relationships, operations and awareness. Manufacturers need new ways to recycle waste materials and new ways to source recycled inputs to products. HABU(R) enables product manufacturers and brands to accelerate towards the circular economy by helping solve the operational challenges involved. Every manufactured product is a material Host. Every product or product manufacturer is a material Source. Finding Hosts for Sources is not trivial and readying Sources to meet the needs of Hosts is not easy. We handle the Who's, What's, Where's and How's to doing HABU(R). Recognizing the success of Sources and Hosts is important. Our marketing and recognition promotes the achievements and efforts of companies using the HABU(R) philosophy in their products and operations.